Congress is poised to pass a tax bill that will affect every American. The effects on your family will vary depending on your income level and what deductions you take. Regardless of whether you think this tax cut is a positive or negative for the economy and country, passage of the bill means that you’re likely to see a larger paycheck next year as the government withholds fewer taxes. For example, an individual earning $75K will face a top Federal income tax rate of 22% instead of 25%, lowering their taxes by approximately $1000. 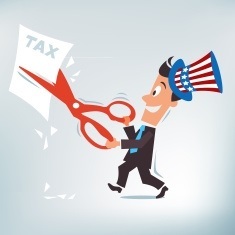 Changes to the standard deductions, limits on itemized deductions and increase in child tax credits will affect your level of tax savings as well. The question to ask yourself now is, what are you going to do with that windfall? If you’re fortunate enough to be in a place where you can pay your bills and buy food for your family, then you may be tempted to spend that money on something fun. It’s holiday season and we are all feeling generous. You may be tempted to buy another gift for the kids, or donate an extra amount to your favorite charity. Or even to splurge on that gorgeous new handbag you spotted last week. But take a few moments and ask yourself – am I meeting all my financial goals? Have you paid off your debts? Are you contributing enough to your retirement accounts to provide a comfortable income in retirement? Republicans have announced plans to cut Social Security, Medicare and other safety nets because they claim to be worried about the rising debt. It’s reasonable to doubt that claim since their proposed tax cut will add $1 trillion to the debt under the rosiest of economic outcomes. So before you spend that extra money, keep in mind that you may not have the same Medicare and Social Security benefits that your parents are currently enjoying. And if you’re laid off and can’t find work immediately in the next recession, the social safety net may be severely reduced. Hopefully, your parents live nearby so you can move in with them! It’s not nearly as fun as browsing on Amazon, but take a few moments now to think about your long-term goals. Increasing your 401k contribution by 1-2% or paying off your credit card debt more quickly will help your family far more than another X-Box game or a new handbag ever will. The new year is always a good time for taking stock and making plans to be better. Congress is giving you a gift to make that easier. Use it wisely. Not sure if you’re on track or should be saving more? Give us a call and let’s talk!